The story of wheat from sowing seed to slurping spaghetti. 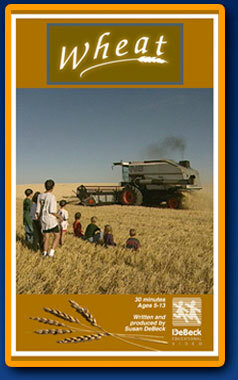 Wheat follows the activities on a family wheat farm from seed cleaning and planting through to harvesting the golden fields of wheat. It continues the journey to a flour mill and pasta plant. A 4000 year old Egyptian model of bread making demonstrates the importance of wheat in their lives as does the story of Joseph and his interpretation of the pharoah's dream. A visit to a pioneer village shows pioneers wheat flailing, winnowing, and wheat milling at a grist mill. The Little Red Hen makes a brief appearance. Children in the video grow their own wheat seeds, pound wheat kernels into flour, and test for starch in flour. They roll chapatis, toss pizza and slurp spaghetti. They join in the ancient craft of wheat weaving and then end singing The Wheat Waltz. Wheat is available without the Joseph story. Please order Wheat-No Joseph if you wish this version. "And it ranges from ancient Egyptian famines to tonight's pizza dinner, touching on history, art, literature, science, technology and gastronomy. Another winner for school and library collections." Ages 5 up. The life cycle of the wheat plant, the harvest cycle of the modern wheat farm, and the ages-old significance of this grain to humans are involvingly explored here. With the sure-fire formula of Cranberry Bounce [BKL F 1 92] and Apples [BKL l My 15 97], the video makes a familiar food the intriguing focus of location footage, interpretive diagrams, artist illustrations, and an attentive script.